90 Marlborough is located on the south side of Marlborough, between Berkeley and Clarendon, with 88 Marlborough to the east and 92 Marlborough to the west. 90 Marlborough was built ca. 1872 as the home of Robert Charles Winthrop and his wife Cornelia Adelaide (Granger) Winthrop. They previously had lived at 145 Beacon. They also maintained a residence in Brookline. Robert Winthrop was President of the Massachusetts Historical Society, a former Speaker of the US House of Representatives, and a former US Senator. 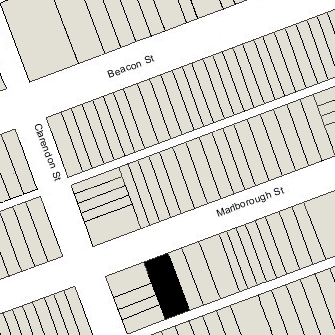 Cornelia Winthrop purchased the land for 90 Marlborough on May 18, 1871, combining two 24 foot wide lots. She purchased the western lot from architect John H. Sturgis, and the eastern lot from Miss Ann Wainwright Davis. The western 12 feet was part of land originally purchased it from the Commonwealth on July 30, 1862, by David Snow, who had sold it to John Sturgis. The eastern 32 feet were part of a 60 foot wide lot owned by Ann Davis, and had originally been part of a 220 foot parcel that Henry Lee, Jr., and Jonathan Amory Davis, Ann Davis’s father, had purchased from the Commonwealth of Massachusetts on November 14, 1863. J. Amory Davis died in May of 1865 and his interest was inherited by his daughter. On October 6, 1865, she transferred her interest in the eastern 160 feet to Henry Lee, and he transferred his interest in the western 60 feet to her. Click here for an index to the deeds for 90 Marlborough. Cornelia Winthrop died in June of 1892 and Robert Winthrop died in November of 1894. 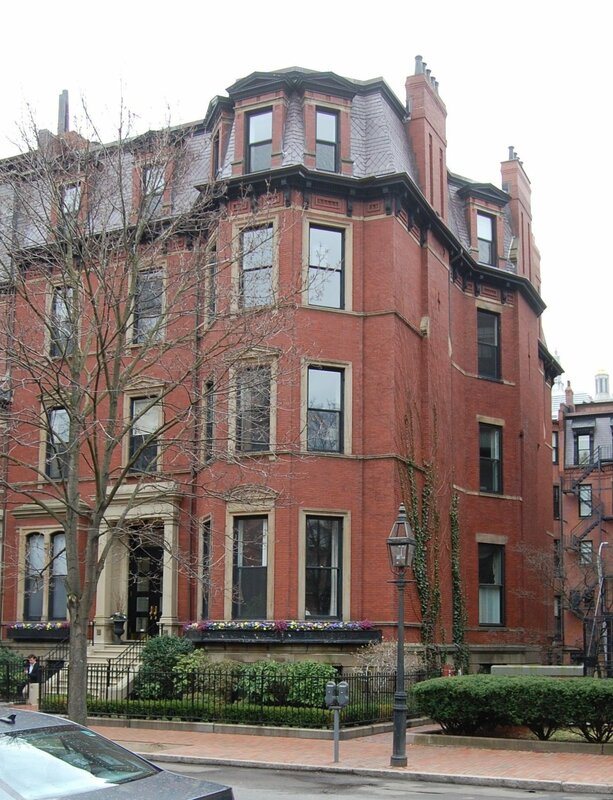 Their daughter, Eliza, continued to live at 90 Marlborough during the 1894-1895 winter season, but moved thereafter to The Charlesgate at 535 Beacon. 90 Marlborough was not listed in the 1896 Blue Book. On April 28, 1896, 90 Marlborough was acquired from Cornelia Winthrop’s estate by Eben Sumner Draper. He and his wife, Nannie (Bristow) Draper, made it their home. They previously had lived in Hopedale, where they continued to maintain a home. Eben S. Draper was a manufacturer of cotton machinery in the firm founded by father in Hopedale. He served as Lieutenant Governor of Massachusetts in 1906-1908, and as Governor in 1909 and 1910. 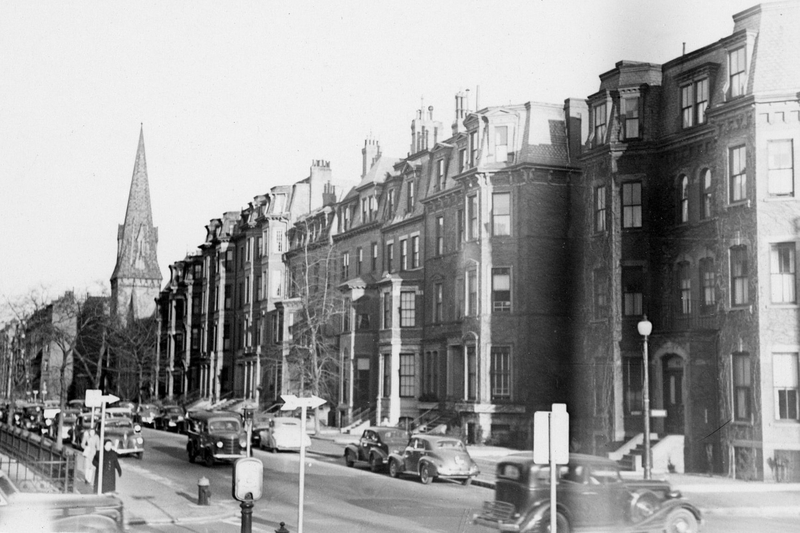 The Drapers continued to live at 90 Marlborough until about 1905, when they moved to a new home they had built at 150 Beacon, replacing 150-152 Beacon (the former home of John and Isabella Stewart Gardner). On May 15, 1905, 90 Marlborough was purchased from Eben S. Draper by Alice McClure (Peters) Burr, the wife of Isaac Tucker Burr, Jr., a banker and broker. 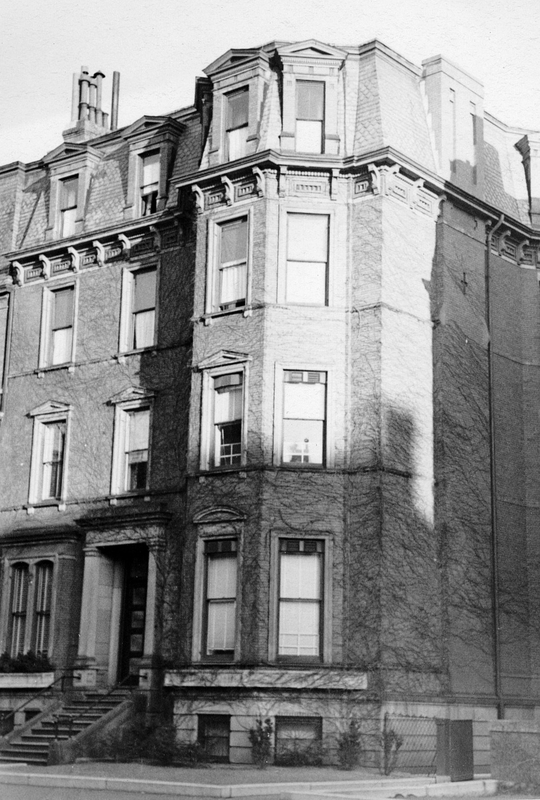 They lived at 127 Commonwealth at the time of the purchase, and moved to 90 Marlborough after extensively remodeling it. They also maintained a home in Milton. During the 1911-1912 winter season they were traveling abroad and 90 Marlborough was the home of Bayard Thayer, a noted yachtsman, and his wife, Ruth (Simpkins) Thayer. They also maintained a home in Lancaster. By the next season they had moved to a new home they had built at 83-84 Beacon, and the Burrs had resumed living at 90 Marlborough. During the 1920-1921 and 1921-1922 winter seasons the Burrs were again traveling abroad. During the 1920-1921 season, 90 Marlborough was the home of Bayard Warren and his wife, Elizabeth (Sears) Warren. They also maintained a home in Prides Crossing. He was a trustee of estates. They had moved by the next season, and during the 1922-1923 season were living at 35 Commonwealth. During the 1921-1922 winter season, 90 Marlborough was the home of wool merchant William Arthur Dupee and his wife, Clara Ethel (Purdon) Dupee. They previously had lived in Milton. By the 1922-1923 season they were living in Hyde Park, and by the 1923-1924 season were living at 181 Commonwealth. The Burrs resumed living at 90 Marlborough during the 1922-1923 season, but by 1925 had moved to the Hotel Agassiz at 191 Commonwealth. On May 12, 1924, 90 Marlborough was purchased from the Burrs by the Katharine Gibbs School for use as classrooms, and possibly as offices and staff housing. The school previously had been located at 247 Berkeley. It subsequently acquired 151 Commonwealth in September of 1924, 92 Marlborough in April of 1926, 135 Commonwealth in September of 1927, 303 Dartmouth in October of 1930, and 21-23 Marlborough in August of 1936. On August 31, 1953, 90 Marlborough was acquired by real estate dealer Thomas J. Diab’s Baid Realty Corporation (Baid being the reverse spelling of Diab). At the same time, he also acquired 92 Marlborough, 151 Commonwealth, 135 Commonwealth, and 303 Dartmouth from the school. The school retained 21-23 Marlborough, converting them from dormitories to classrooms. On December 6, 1954, 90 Marlborough was acquired from Baid Realty by the Chamberlain School of Retailing. It continued to be located there in the 1980s. 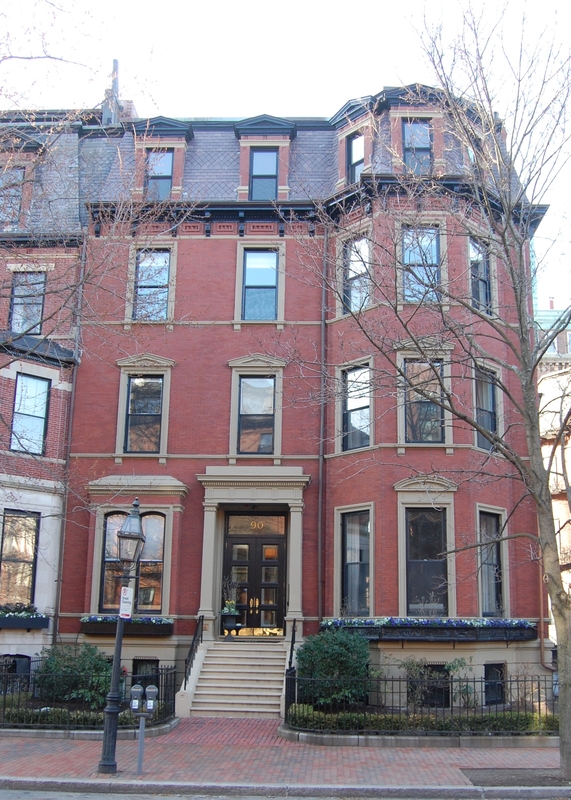 On September 8, 1989, 90 Marlborough was purchased from Chamberlain School by Mark J. Connaughton, trustee of the 90 Marlborough Street Realty Trust. In October of 1989, he applied for (and subsequently received) permission to convert 90 Marlborough from a school into seven apartments. 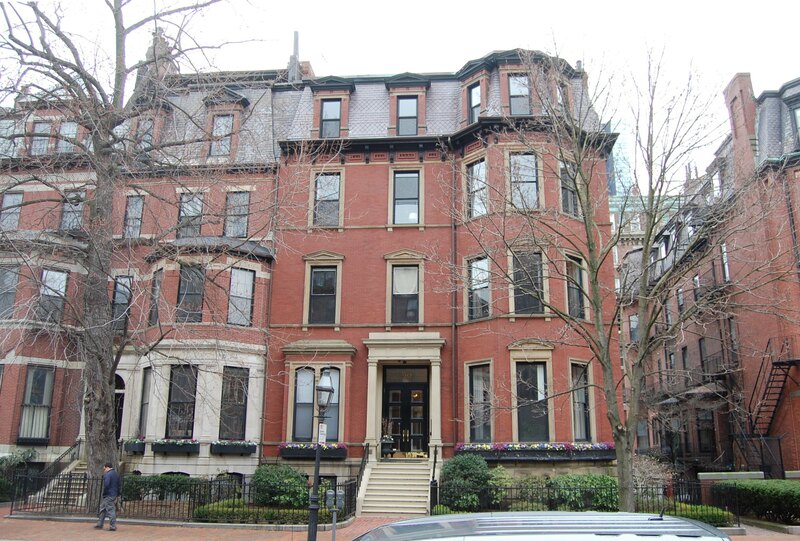 On August 31, 1990, Mark Connaughton converted the property into seven condominium units, the 90 Marlborough Street Condominium.